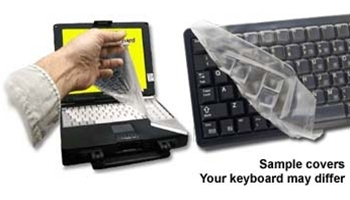 DataCal's transparent protective keyboard covers are designed to mold perfectly to your keyboard, keypad or other equipment; thus providing excellent protection from spills, debris, dirt and other contaminants. Cleaning and disinfecting are simple and can be done without the removal of the cover. DataCal also carries a universal laptop cover as well as screen covers for your computer monitor. Protect your investment with custom molded covers from DataCal.